Whether you’ve lived in your apartment for a few months or a few years, some simple tweaks can drastically improve the feel and function of your home. If you love the space you’re in but feel like it isn’t decorated to its full potential, that it’s missing that special something that turns an “apartment” into an “apartment home,” enter the “Makeover My LPC APT” contest! Lincoln Property Company is partnering with CORT Furniture to provide one LPC resident a CORT designer consultation along with a complete apartment makeover, valued at up to $20,000! Along with a consultation, the makeover includes new houseware items, new home furnishings, a TV, and more! Record a 1-2 minute video about what made you choose your apartment and why you deserve an apartment makeover. 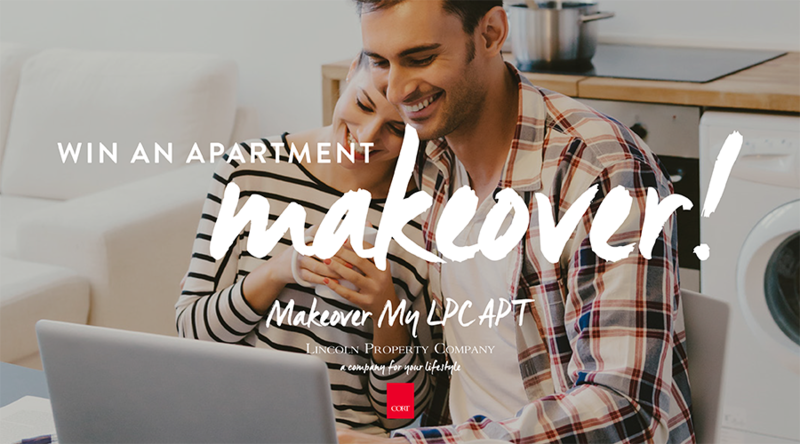 Then head over to the “Makeover My LPC APT” contest page to share your story and officially enter. We will be accepting submissions from current Lincoln Property Company residents on Thursday, June 1st through Friday, June 30th. The winner will be announced on the Lincoln Property Company’s Facebook page. Check out the video below and see the official rules for more details.